Use this post however you find helpful. Reprint, repost, link to it or whatever. A link back to https://scottlinscott.wordpress.com would be awesome. This entry was posted in Christianity and tagged apathy, overload, parenting, sports commitments. Bookmark the permalink. 163 Responses to Your kid’s an All Star? Wow! Someday he’ll be average like the rest of us. Never underestimate the ability of people to home in on the bit that got them mad and then fail to read/understand the rest of an excellent article. Thank you Scott for sharing your time and experiences in this blog. We might not share the same opinion on all aspects of your blog but I certainly respect them. Isn’t that what being a Christian is about. I have never wrote in the comments on a blog before but when I started reading all the negative comments and name calling ” worst kind of Christian” it struck me as indifferent. As a follower of Christ with two small children whom my life hope for is to follow Him as well find by the shear fact of criticizing and name calling is no where near the teachings of the Christ I follow. From my understanding we as Christians live and act a certain way and that is in the image of Christ. When we start judging people then we are no longer following God but we are playing God. I hope you continue you service and telling your story’s and experiences that you have found in your relationship with Christ. I will certainly pray for you and your family along with the people who deem it necessary to use harsh words because of differences of opinion. Thanks Paul. I wrote this a few years ago and it sure did hit a nerve! I’ve never read through all the comments but have seen them when they’ve come through for moderation. I’ve been struck by the fact that some people are clearly wounded and angry. That saddens me. I have refrained from posting until this point – but as this blog continues to be circulated virally within my network, it’s time for me to speak up. While I appreciate the context of this article, there are so many things wrong with it. #1 – the author didn’t practice what he speaks – as I believe the content speaks in extremes (an all or nothing approach – at least that is my interpretation). His kids all participated in sports and went on to play in college. #2 – every kid is different. Every family is different. One guy’s opinion shouldn’t be taken as gospel. #3 – our kids’ spiritual lives shouldn’t be ‘the church’ – but rather the church is a vehicle for growth – not the be all and end all for their Christianity. #4 – on the flip side, there are plenty of psycho sports parents out that (case in point, the reality show Dance Moms is a perfect example of insanity.) #5 – there are more issues than sports as to why kids aren’t staying in church. I know plenty of kids raised in the church in great homes that participated in all things church – and those kids have walked away. We have a much bigger issue than sports. It’s a cultural norm. It’s a sociological issue. In order to understand the problem, you need to understand the generation and the culture in which they live. We as a culture have created this, not sports, or school. I speak from experience. I know the inner battle of having a truly gifted child (not one that I pushed into a sport, or one that I tried to live vicariously through – a truly God-gifted athlete). How do you strike that balance. She was in the gym on average 20 hours per week and was on a college track. She was very active in church, youth group, activities and events. She rarely missed due to her athletics. It was through the process of we as parents listening to HER (what a concept, I know. Open, honest 2-way communication with our kids. I don’t mean to be cynical, I just see so many parents disrespecting their kids. There’s no communication – just barking a bunch of ‘you need to do this and you need to do that. But I digress. My daughter felt the sport sucking the life out of her. So she ‘retired’. It was a tough transition for all of us. She had been in the gym more of her lifetime than not. We lost a circle of friends. We lost the structure we had built – the normal that we lived. But as a family, we had to come to the conclusion that we weren’t going to ‘force’ her to do anything that wasn’t right in her spirit. The decision took months and there were many tears. But it was the right thing for HER. So where are the college scholarship opportunities now? Largely non-existent. 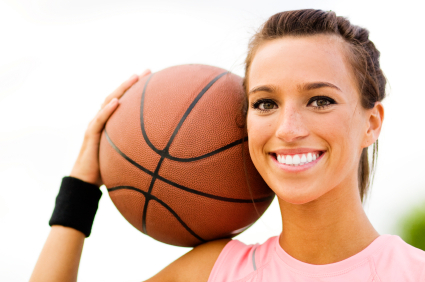 Unless she is on the club track, recruiters almost NEVER look at athletes in her sport. But the good news is she competed on a high school team, was first in the state and broke the state record. All for the love of the sport – not the pressure of the competition. So I share all this to say – Parents, it’s up to you to strike that balance for your child. Ensure their spiritual growth is #! for sure. But they can have their sports and their school activities too. (There are plenty of outspoken Christian collegiate and pro athletes to prove it.) Have meaningful dialog with your children – really listen to their hearts. But at the end of the day – you’re still the parent. Pray about it. And take blogs like this with a grain of salt – not as gospel truth. This blogger doesn’t have to stand in front of God someday and be accountable for how YOU raised YOUR children. Exactly! This is what I discuss with the plea to make faith development top priority. I am not advocating legalistic church attendance in this post but am encouraging perspective. To many slide faith community activity right out the window when scheduling conflict arises. Our children learn what is most important to us. Scott, thank you for this post. My own parents pretty much did the opposite of what your points said, which was, don’t prioritize sports/band (band geek here, didn’t play sports), church is priority, church is fun, grades matter, but health/communication matters more. I hate the glorification sports receive, because kids turn it into their life. How many people do you know, _period_, from your high school life that entered into a pro league? Not just a college league, but the making millions bit? On average, probably 0. And it’s not you. Sports DO NOT MATTER for most people except for recreation and fitness. Full stop. It’s not important for college. Most of the students that go to school do not participate in the college teams. STEM majors are usually wanted everywhere, and often don’t even require 3.8+ GPAs to land acceptance, even at higher teir schools. Yeah, you might not get into a D1 school, but there’s plenty of good lower division/private schools that will gladly take your dollar and give you an accredited degree after you’ve earned it. All without being in a sports program. Church does matter, but so many people make it a secondary priority. You know who needs spare hands to hand out food to the needy? Not your sports team. What about cleaning up the trash in your neighborhood? Your sports team is too busy practicing and feeding their own egos. Building a community with the elderly, poor, lost, the youth, other families your own age, people who might land you your dream job? Nope, got a game tonight, too busy. Bible study before work? Too tired from last nights game, don’t want to get up early. So I’m a little irate to be sure. Church is important. It’s important to the community, you help support those in need, you support your peers, you learn more about Christ. A little background on me: I am a former collegiate athlete, conference player of the year, and all-american. I was twice named the NAIA D-1 National Player of the Week. I was a two-time academic all-american. I hold the record at my college for points in a single game and season field goal %. I scored over 1,000 points in my career and am in the top ten in a couple other statistical categories. Growing up, my parents allowed us to miss Sunday or Wednesday night activities for sports but we never, ever, ever missed Sunday mornings. In fact, my brother (an incredible athlete) was cut from an AAU team because he wasn’t allowed to play Sunday mornings. We were highly, highly involved in church. I attended a Christian high school and took/take my relationship with God seriously. My parents were and continue to be incredible role models of what it means to be a Christian adult. When I finished my collegiate basketball career, I experienced the worst depression I can possibly imagine. I won’t go into too much detail, but I honestly don’t think losing a child would be more emotionally gut wrenching than what I went through. If there is such a thing as hell on earth, I walked through it. I know that sounds ridiculous, but despite all my parent’s efforts to keep God first, and my own walk with the Lord, I didn’t realize that sports had become my god until it was too late. When that “god” was taken away, I experienced loneliness, loss of purpose, and deep depression. This is the long-story-short version, but in summation: even if your kid legitimately IS a star, and even if you try to keep God first, getting priorities out of whack is very, very easy and not very noticeable unless you pay close attention. Take inventory of your life, daily, to make sure your priorities are right. I wouldn’t wish what I went through after my career was over on my worst enemy. Encouraging and needed article. Thanks for writing. It’s the replies that shock me. I’m amazed at the number of negative replies to your article. In essence, these parents are saying, “let’s worship academics and athletics over God.” Sounds a lot like the children of Israel at the foot of Mt. Sinai contributing their jewelery to make the golden calf. That didn’t end real well, and neither will “Christian” families who pursue the American Dream instead of pursuing God. Yes, Paul, this post did hit a nerve. I feel like some missed a major point entirely and read harsh legalism into it at the expense of my encouragement to parents to model and pursue a vibrant, growing relationship with Jesus first and foremost in their own lives. You are the worst example of a Christian father. Church is important yes, you should ingrain that in your children. But you should also teach them the importance of academics, those top 5 people in their high school class went to great colleges. Maybe they succeeded, maybe they didn’t, but they had a great opportunity. My parents were apathetic in my school, and never pushed me to be in sports, actually discouraging sports. I barely made it into college because I was never motivated. I got to college and figured out I have a genius level IQ and have natural talent in basketball and football. Just late enough for it to do me no good. I thank God I was in church, and that is important to me, and today I’m in ministry. But I should have tried to be the best in my school, academically and athletically. So before you spout out garbage about forcing kids into the church and not giving them a future, realize that their entire life rests in your hands. Push them to be the best in everything, not one thing. Wow. The worst? Dang. Thankfully my kids powered through somehow and today have real and vibrant faith walks with one being an MD/Phd, another an MA behaviorist and the third a graduate of the top culinary school in America and a teaching assistant and restaurant manager at 22 years old. Thankfully their best mom balanced out their worst dad. Christian community is important and must be a priority. Actually the title is not sarcastic but is truth 99.9% of the time. Sports out of balance can cause more harm than good. I’m 51 years old, 4 kids out the door and one left at home. I already know so much of this info above…from making many of these mistakes. Next time you’re going to put together a good post like this, please do it in about 1987. Thanks! Pingback: Back to School « This is our story… this is our song.